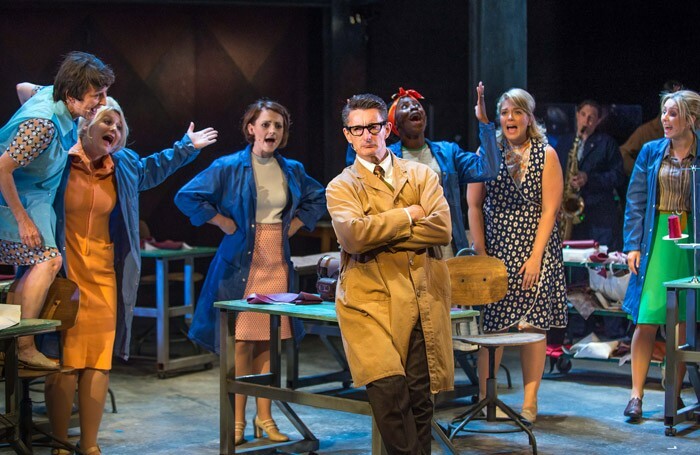 Douglas Rintoul, newly appointed artistic director of the Queen’s Theatre, makes an appropriate and smart directorial debut at the venue with the first post-West End outing for Made in Dagenham, the musical based on the 2010 film of the same name that premiered at the Adelphi Theatre in 2014. The thrill of seeing it again here is not just that it feels literally at home in Hornchurch – which is less than five miles from Dagenham – but also that, in this version, it feels so heartfelt and sincere. This is a much lower-key but far more authentic production. Gone are the giant, imposing Airfix-inspired sets that represented a car manufacturing production line. Instead there is a far grittier integrity as Hayley Grindle’s deliberately dowdy designs whisk us, with little change of setting, from factory floor to union meetings and domestic scenes. It is the actors and the songs that have to carry the dramatic momentum, particularly as the actors also function as musicians on the side of the stage. This makes the show feel like a direct descendant of the Stratford East shows of Joan Littlewood and Blood Brothers in its heartfelt portrait of working class lives. It feels far more real and less reliant on spectacle. There are poignant personal and public battles being waged, as female machinists at Ford Motor Plant embark on a campaign for equal pay with their male colleagues. Though based on the factual events of a 1968 strike, this fictionalised version of their story gives them a powerful voice. The terrific cast of actor-musicians is led by Daniella Bowen’s feisty Rita O’Grady, who finds her own campaigning voice, with terrific supporting contributions from Wendy Morgan, Claire Machin, Angela Bain and Loren O’Dair. It’s a great reclamation for an important British musical whose social conscience proved too testing for popular West End consumption.